With a big focus on the camera and screen display, the Nokia 3.1 is a great budget starter phone, especially for teens. The under-$200 phone market has become highly competitive as more advanced hardware and operating systems become the standard. The Nokia 3.1 cuts corners when it comes to advanced processing power, storage space, and battery life, as is typical for budget phones. But it does feature one of the best cameras you can get in this price range, a movie-ready 18:9 screen ratio, and the more advanced Android 8.0 operating system (with two years of guaranteed OS updates). These features make it one of the more desirable entry-level phones on the market and a particularly good starter phone. The Nokia 3.1 most resembles the look and feel of the older iPhones, with a Gorilla Glass display surrounded by an aluminum case. With a thickness of only 0.34 inches, it’s remarkably thin and light without feeling overly fragile (though it does feel naked without a case). The 3.1 includes two SIM card slots and a slot for microSD card storage. The 5.2-inch screen size feels a bit small compared to beefier phones, but it’s more than acceptable for the price range. Without any kind of exterior button or fingerprint sensor on the front, however, the bottom inch looks like wasted space that makes the screen feel even smaller. You can double-tap the screen to wake the phone, but without a fingerprint sensor you’ll need to enter your PIN or password every time, if you set one. As a last note, we were also unimpressed with the hard, clicky power and volume buttons on the right side. They require a significant amount of pressure to operate and were a constant source of mild irritation. The Nokia 3.1 easily recognized our SIM card and offered to automatically download any or all of the apps on our previous Android phone. It also required a major system update which took several minutes even on a Wi-Fi network, with another update arriving shortly after we finished setup. After that, it was smooth sailing as we quickly set up the Google voice assistant. The phone pre-installs many commonly used Google apps, including Google Maps, Google Music, and Google Photos. The Nokia 3.1 features an MT6750N Octa Core 1.5 GHz processor. It’s good enough to play low-powered mobile games (like puzzle and board games), but you’re never going to be able to run complex 3D action games very well with an under-$200 phone. We experienced major framerate issues during the high-quality GFX Benchmark tests, resulting in 19 fps for the T-Rex test and reducing the Car Chase 2.0 test to a veritable slideshow, averaging just 4 fps. The PC Mark Work 2.0 test was similarly disappointing, with a final score of just over 3,000. This puts it at the low end of smartphone performance when it comes to web browsing. But in terms of performance for phones in this price range, it’s pretty par for the course. With only 2 GB of RAM, the Nokia 3.1 can be a bit sluggish when switching between apps or loading different web pages. But we were still able to play through a full match of PUBG Mobile on low settings with only occasional stuttering and texture popping. We had a few odd hiccups with the Nokia 3.1 not recognizing our Wi-Fi network at first, but restarting the phone fixed the issue. Using the Ookla Speedtest, we achieved download speeds of around 15 Mbps and upload speeds around 7 Mbps outdoors in the suburbs on 4G LTE. Inside, the connectivity dropped sharply, achieving download and upload speeds of only around 3 or 4 Mbps. Check out some of the FAQs about LTE. Although the 5.2-inch screen size and 720p resolution won’t compete with bigger, more expensive phones, the Nokia 3.1’s 18:9 screen ratio makes it a fine choice for streaming movies. Big cinematic blockbusters take full advantage of the phone’s wide screen and vivid colors, a clear winner for those who can’t stand seeing a pinched wide screen surrounded by black bars. With Android 8 comes the nifty Picture-in-Picture feature. This lets you continue to watch Netflix or Youtube while browsing the web or answering emails. The smaller video can easily be dragged around to any corner of the screen or dismissed by flicking it towards the bottom. We were very impressed with how easily this feature was integrated. Want to take a look at some other options? See our guide to the best cell phones for senior citizens. The Nokia 3.1’s 18:9 screen ratio makes it a fine choice for streaming movies. We had no audio issues with Nokia 3.1, whether listening to phone calls or streaming music from Spotify. Sound came in crystal clear. There’s a single sound enhancement option buried in the settings called BesLoudness, which boosts the overall volume significantly. BesLoudness is on by default, and puts out an impressive range of sound from the tiny speakers located next to the Micro USB charging port. The Nokia 3.1 is packaged with a very basic pair of earbuds. The audio jack located at the top of the phone. The camera is one of the Nokia 3.1’s primary selling points. The 13 MP rear camera makes it one of the best camera phones on the market for the price. However, it’s important to note that the resolution defaults to a square-shaped 4:3. The 3.1 can take widescreen pictures at 16:9 and even 18:9 resolution, but the picture quality is degraded to 8 MP, and should primarily be used for landscape pictures in full lighting. The front camera natively shoots an 8 MP picture at 4:3 resolution, downgrading to 6 MP for a wider shot. Both cameras include an optional Beauty mode that digitally smooths out wrinkles and facial blemishes. Both cameras also support HDR, resulting in slightly slower picture-taking for improved lighting quality in most situations. The video quality is even better, recording full 1080p HD video quality at the push of a button, with 720p from the front camera at a standard 30 frames per second. You can even stream live broadcasts directly from the phone camera by logging into Facebook or YouTube. A snug, light frame doesn’t leave much room for a battery, and those nice camera and video features will rapidly drain your power. Also, the Nokia 3.1’s 2,900 mAh battery is nothing to write home about, so you’re going to feel the sting if you miss charging it overnight. It does include a few quality-of-life options to extend battery life, such as automatically entering battery saver mode when at 15%, and the option to deactivate certain apps from running in the background. But there are no fast-charging capabilities; the Nokia 3.1 takes well over two hours to fully charge. The adaptive brightness feature was a source of annoyance and frustration, often changing the brightness levels despite our lighting remaining the same, and occasionally dimming far too much. For the first time since we’ve seen this feature in a phone, we opted to leave it off. Take a peek at our guide to improving your cell phone battery. The Android 8 operating system is another big selling point for the Nokia 3.1. The OS supports Android One, which keeps the phone consistently up to date with the latest Android system updates and security patches for the next two years. Android 8 also makes it easier to quickly check individual notifications without opening the app, simply by holding down the app icon. Android One phones pre-install all the usual apps from Google to help navigate different media, such as Google Music, Google Photos, and Google Drive. None of the apps felt extraneous or obtrusive. The OS supports Android One, which keeps the phone up to date with the latest Android system updates and security patches. Budget phones often come up short when it comes to storage space, and the Nokia 3.1 is no exception. That fancy Android 8 operating system takes up nearly half of the 16 GB internal storage, filling up quickly from photos and videos and leaving little wiggle room for larger gaming apps. Additional storage space can be acquired by slotting in a micro SD card (up to 128 GB). Check out our guide to Google Android. Budget phones are highly competitive and often fluctuate in price. The Nokia 3.1 retails for $159, and its tech specs reflect its low price. At that price point, we don’t expect a lot of internal storage or a powerful processor, but we were impressed with the little Nokia’s relatively powerful camera. Android One support is a very nice feature to have, though cheaper budget phones may not need to last long enough to take advantage of the two years of Android OS upgrades. The LG K30 is another sub-$150 phone that’s similar to the Nokia 3.1. We enjoyed the exterior design of the K30 more, but under the hood the processor, battery, storage space, and display settings are largely the same. The K30 includes a comfortable fingerprint sensor and better exterior buttons, but the Nokia 3.1 features a more powerful camera, and that nice Android One support. If you’re willing to pay a bit more, you can get a lot more bang for your buck with phones like the Moto G6 ($249 MSRP but typically sold for less) and Honor 7X ($199 MSRP). Both feature bigger batteries, bigger screen sizes, and better processors, and in the case of the Honor 7X, a dual-lens rear camera. Need some more help finding what you're looking for? Read through our reviews of the best smartphones to buy under $300. One of the best devices for the price, and a solid starter phone. We were disappointed with the physical design of the Nokia 3.1, which was exacerbated by the lack of a fingerprint sensor and the poorly-designed physical buttons. 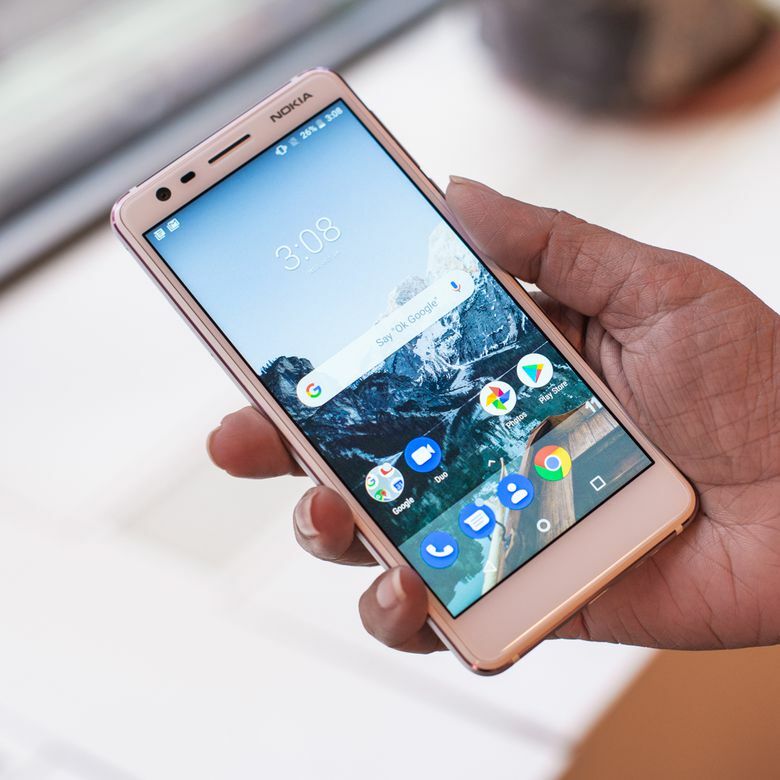 But the Nokia 3.1’s insides and Android One support outweigh the budget-standard design shortcomings and make this a great starter smartphone. Product Dimensions 5.8 x 2.7 x 0.3 in.